Every year millions of high school students are assigned to read To Kill a Mockingbird in their English class. Many will begrudgingly read it, while others will look past the forced reading assignment and fall in love with this book. I fall under the latter category. It’s been a while since I read Harper Lee’s much loved book, but the story and characters remain fresh in my memory. To this day I count To Kill a Mockingbird as one of my favorite books. So if you love the story like me, you can see it come to life on stage on the Guthrie Theater’s Wurtle Thrust Stage. Set in 1936 Maycomb, Alabama, To Kill a Mockingbird follows Jean Louise “Scout” and her brother Jem over the summer as their father Atticus Finch represents what could be the biggest case of his career. As the no holds barred Jean Louise “Scout” Finch, Mary Bair is exquisite. She is a natural on the stage and flawlessly brings to life the beloved character. Noah Deets as Jem Finch and Isaac Leer as Dill are perfectly cast and are naturals on the stage as well. Stacia Rice takes on the narrator role as Miss Maudie Atkinson and neighbor to the Finchs. She ushers the story along and fills in the pieces needed to understand the story, but not need to be played out on the stage. As Atticus Finch, Baylen Thomas embodies the visual of Gregory Peck from the movie version. James Youmans designed a beautiful and simple set that doesn’t distract from the story itself. I loved his use of various shades of wood to cover the floor and back wall of the stage. The only true scene change is the courtroom scene which is a stark contrast to the others with the large white desk and elevated seating area. Whether you’re a fan of the novel or looking for a great way to spend a few hours at the theatre, To Kill a Mockingbird is a show not to be missed. The story may take place almost 80 years ago, but the themes and content are just as relevant in today’s world. 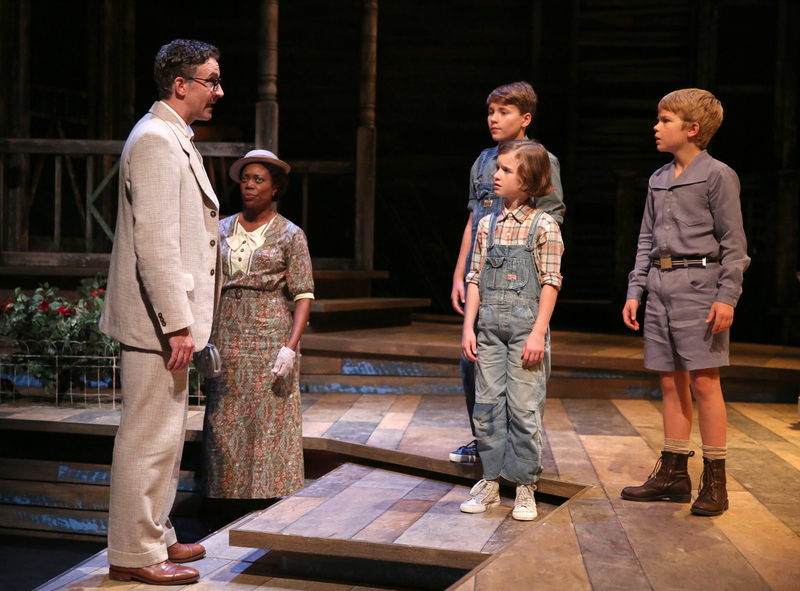 To Kill a Mockingbird is playing at the Guthrie Theater through October 25. For more information, visit the Guthrie’s website.